Tomb is a free and open source file encryption tool to protect your secret files in GNU/Linux operating systems. It allows the users to create a encrypted storage (a folder) in the file system and save the important data in it. The encrypted storage can be opened and closed using their associated keyfiles, which are also protected by a password chosen by the user. For the sake of security, you can save the keyfiles on a separate medium, say for example an USB drive or a CD/DVD. The encrypted folders are called “tombs”. You can create any number of tombs in your hard drive as long as it has enough free space. A tomb can only be opened if you have both the keyfile and the password. It also has advanced features, like steganography, which allows you to hide the keyfiles within another file. Even though, Tomb is a CLI tool, it also has a GUI wrapper called gtomb, which makes the usage of Tomb much easier for the beginners. In this brief tutorial, let us see how to install Tomb and how to use it to encrypt the files in Linux. Tomb will only work on GNU/Linux at this time. In Arch Linux, Tomb is available in AUR. So, you can install it using AUR helper tools such as Yay as shown below. SparkyLinux (A Debian derivative) developers have added Tomb package in their official repositories. So, you can install it by adding the SparkyLinux main repositories in your DEB based system. For other Linux distributions, follow the steps provided here. Like I said already, we call encrypted directory as “tomb”. Each tomb can be opened using their associated keyfile and password. Let us create a new tomb, say for example ostechnix, with size 100MB. You need to be either root user or have sudo privileges to create tombs. Create a keyfile used to lock the newly created tomb. Note: If you encountered an error like below, there might an active swap partition. tomb [W] This poses a security risk. tomb [W] [#163] I may not detect plain swaps on an encrypted volume. tomb [W] But if you want to proceed like this, use the -f (force) flag. Deactivate all swap partitions to fix this as shown below. And, then re-run the command to create keyfile. It will take some time. Keep using this computer on other tasks to create enough Entropy. Follow the steps below to quickly generate enough entropy. After few minutes, once enough entropy has been generated, you’ll be asked to enter a new password to secure the key. Enter it twice. We have just created a keyfile. After entering a password, you’ll see an output something like below. tomb . Checking if the tomb is empty (we never step on somebody else's bones). tomb . Fine, this tomb seems empty. tomb . Key is valid. tomb . Formatting Luks mapped device. tomb . Formatting your Tomb with Ext3/Ext4 filesystem. 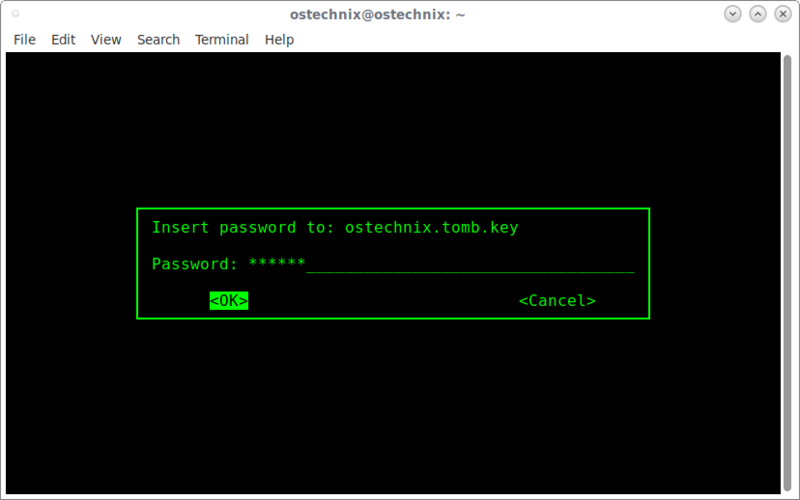 Now, we have a 100MB tomb called “ostechnix”, and locked it down using a keyfile, which is also protected by a password. Since this is just demonstration purpose. I have stored the keyfile and tomb in the same directory (my $HOME directory). For the sake of security, you shouldn’t keep your keys where your tomb is! If you have stored the keyfile in a different path or medium, you need to mention the correct the path value of keyfile while opening the tombs. Congratulations! The tomb has been mounted under /media directory (i.e /media/ostechnix in my case). Now, you can save your secret files/folders in this tomb (i.e encrypted directory). Again, you need to be sudo or root user to save the data in this tomb. tomb (*) Tomb [ostechnix] closed: your bones will rest in peace. The above command will immediately close all open tombs, killing all applications using them. We can use multiple tombs at the same time. All directories and files inside them can be bound to files and directories inside your $HOME, placing all configurations where the applications expect them. For more usage details, refer the official guide. If you don’t comfortable with the command line, you can use Gtomb, the GUI wrapper for Tomb. Launch it from the Menu. This is how gtomb default interface looks like. As you see in the above screenshot, all options are self-explanatory. To create a tomb, choose the first option dig, and click OK. Choose the location where you want to keep the tomb. Next, we need to create keyfile which is used to lock down the the tomb. Choose forge from the main menu and click OK. Enter passphrase twice. Next, choose lock from the main menu to lock down the tomb using the newly created key file. To open the tomb, choose open from the main menu and choose the tomb. As you can see, gtomb usage is fairly easy and straight forward. You don’t have memorize all commands. You can do everything with few mouse clicks. And, that’s all for now. I hope this helps. As far as I tested, Tomb is one of the useful tool ever I have used. It helps you to secure your secret files in an encrypted directory. Give it a try, you won’t be disappointed.